The lowly zucchini will help build and maintain a healthy body and mind. This nutrient-packed health food should not be neglected. It will help you live a long healthy life—full of vim and vigor. Add Zucchini to your diet to give yourself strength and stamina. Zucchini will aid in keeping a healthy heart. Zucchini helps with weight loss. A great food to get more nutrition and keep the weight off. Improves adrenal function and thereby helps prevent disease. 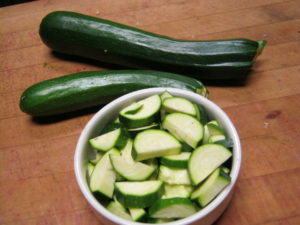 Zucchini will aid digestion, slow your aging, and support healthy circulation, keep a healthy heart. I eat them in my salads—I don’t even peel the innocent victim. We cut them into chunks and freeze them in plastic bags. We shred them and freeze for making zucchini bread. 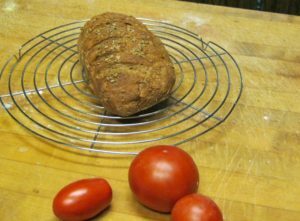 Frozen zucchini makes a hearty bread. I like to put frozen zucchini into many of my meals. Just dump them into whatever my meal might be. We had too many zucchinis last summer, so, I froze them in pieces. Now I just add a hand full of chunks to my food. 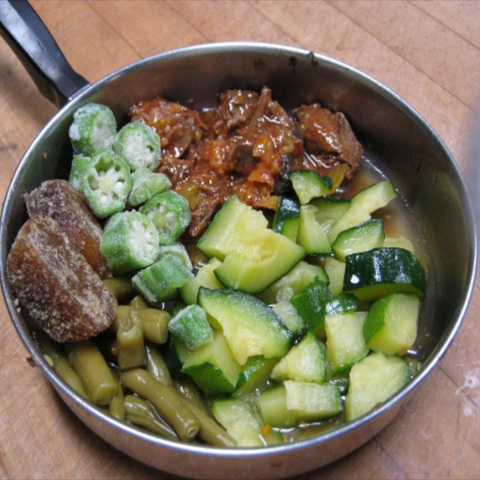 Here is a nice breakfast of zucchini, green beans, okra, frozen beef broth and beef stew. Makes an old guy proud to eat such lowly food.